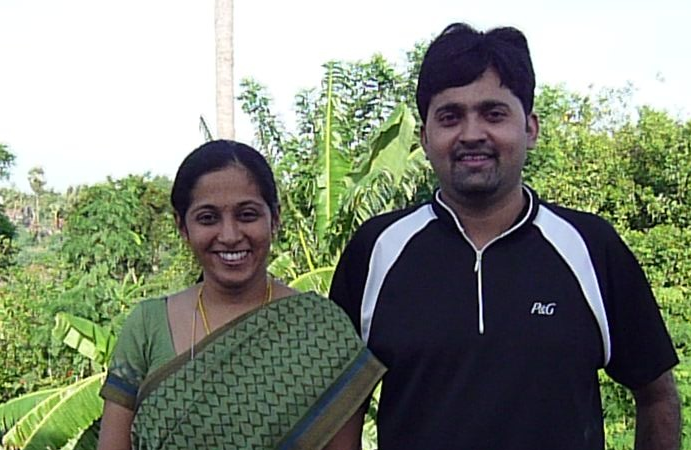 My husband Karthik was diagnosed with Early T Cell ALL in 2011 when he was 33 years old – we had been married for a little over a year and our lives changed overnight. I still remember that Friday morning when I was at work and got a call from him saying he was at the doctor as he wasn’t feeling well and had just been told that he had a huge tumor in his chest. All he told me was that the doctor had told him that they needed more scans to determine what it was. That weekend we moved from Mumbai to Chennai (where we are from) and the following Monday, he started Chemotherapy. He underwent aggressive Chemotherapy in 2011 and was on maintenance chemotherapy by the end of that year. We thought we had put it behind us when we crossed the 2-year mark and he was still cancer-free.. Our excitement was short-lived. Earlier this year, a persistent low grade fever and an ankle injury that refused to heal were the first signs that things were not really going to plan. His doctor decided to do a Bone Marrow Aspiration and we found out the next day that he had relapsed. We knew that his only option was to find an Matched Unrelated Donor (MUD) as his parents and sister are not a match. We have since been contacting as many people as we can to spread the word for people to become donors as this is the only way Karthik, and others like him can hope to have a chance to survive their cancer. So far, given the abysmally low number of Indians on registries world-wide, we have not found a match for Karthik. We spend most of our time combing through emails from potential donors and friends trying to explain the process, to dispel any fear people may have about becoming donors and trying to organize drives. Given the lack of information on the process and the disease, a surprising number of people have come forward to become donors – Over 400 people in the first week! We hope that in a few months, we can help build up the registry in India (DATRI: http://datriworld.org/) by at least a few thousand and then hopefully garner enough attention to get some serious numbers going – this is the only way to ensure that we give all these patients a real chance at life. We continue our periodic searches for Karthik and we hope to hit the jackpot some day – a committed, perfectly-matched (HLA) donor! Karthik’s odds of surviving until his 37th birthday are between 15 – 30% without a matched donor so please help us by becoming a donor as well as by spreading the word among friends, family, co-workers and any other groups you think will be able to help save him and people like him. Hi Rekha Akka! Thank you for reaching out to us! Apart from age, there is not other criteria that matters so if you fall within the age group of 18 – 55 years, please do become a part of Datri’s Registry in India. You can order the kit to provide a donor sample from Datri through their website: http://register.datriworld.org/Aspx1/NewDonorKit.aspx. This is the first step in checking if you are a match for Karthik. Payment to test your donor sample (INR2,500) will have to be made via a Cheque to Datri (details on whom to make the cheque out to are part of the kit) when you send the kit back to them to test your sample. This covers their courier cost to send your sample to the US for testing. Getting on the Registry will help not just Karthik, but other people in situations like his who are looking for a matched unrelated donor… Thanks a ton Akka! Please also help us spread the word. Divya, have you spread the word amongst all IIMs in India, Karthik’s college, respective almumni and networks associated with alumni. I will spread the word here in USA. Has there been a drive in Karthik’s hometown? Hi Kiran, We have actually done all of the above.. Unfortunately we haven’t been able to find an Adult Stem Cell match. He does however have a couple of possible cord blood matches so we’re still looking.. Please do help us spread the word though. Many thanks! Hi please let me know what i have to do to be a potential donor? I am frim bangalore and live very close to the ttk blood bank. Heart felt wishes for a speedy donor match and an even speedier recovery. Thank you for reaching out to us! If you are unable to order the kit from Datri, may I request you to call them at 044-4553 5060 and check with them on how you can go about getting a kit? Please let me know if you are still unable to get through to them. Apart from age, there is not other criteria that matters so if you fall within the age group of 18 – 55 years, please do become a part of Datri’s Registry in India. This will help not just Karthik, but other people in situations like his. Thank you so much for your help! We are counting on support like yours to help find a suitable donor for Karthik. great initiative…wont it make sense to join with raghu rajagopal’s initiative to build on that database further rather than start from scratch…just a thought..
A stem cell transplant does not require the donor and the patient to have the same blood group. Is there a way we can communicate through email and discuss yours and your husband’s situation in greater detail? Kindly oblige. Please do email us at karthikshankaran@gmail.com or divyamoha@gmail.com. We sure that GOD will help karthik to be back like old self ,…..like karthik I know of from Delhi playing around with his grandmother and Ramesh . I will look around for a center at Kuwait to take a swab test . Thank you Mr. Surendar. I will let Karthik know too. Hi Renuka – Thanks – the search for a donor automatically looks into all international registries that are linked to the NMDP and BMDW (like BMDP) to look for matches.. I think it’s great that you are forming a registry in India. But for your husband, can you use the international registries to see if he has a match there? Those registries are fairly large. Hi Ashka, we are looking for matches on all the major registries. DATRI is a registry in India that is operated by Raghu Rajagopal in Chennai and it is the largest registry in India with about 31,000 donors – still very small by any standard. This entry was posted on April 15, 2013 by divyamohan1 in Story and tagged chennai, swab4karthik.